Joe Navarro studies at Phoenix College, and he credits the Chicanos Por La Causa (CPLC) matching scholarship program with lifting the financial weight off his shoulders, and, more importantly to him, off his mother’s shoulders as well.”She’s a single mom and she’s done such a great job of raising me. I know it’s been a struggle and I didn’t want her to be stressed about my college too,” says a grateful Joe.”I graduated from Cesar Chavez High School last year, and I knew I needed to continue my studies to become an Audio Engineer. My mom knew that CPLC gave out scholarships, and she directed me to call them. 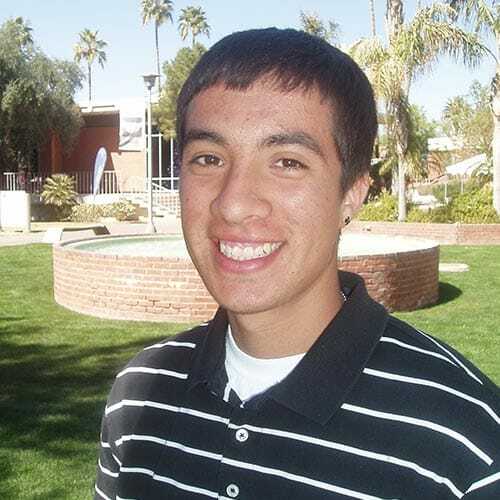 The folks at CPLC made the entire application process so easy for me; they took care and helped me out with all the details so that I could be approved.”Joe explains that he’s a very persistent person, and he thinks that will help him out in his future endeavors, “I work at the team shop for the Suns and the Diamondbacks. It’s a job I really wanted so after I applied for the position I kept calling them, and calling them, until they knew they had to hire me in order to stop me from calling. Joe jokes that when he graduates and enters the workforce to get a job in the music industry, he’ll put his persistency in play again!”I go to school full-time and I have a 3.0 GPA, I work part-time at a fun job and I’m an assistant coach of a girls softball team that my mom coaches. The CPLC scholarship program has helped me keep this great balance in my life and I’m very appreciative,” says the busy teen.